Real Madrid captain Sergio Ramos has responded to fans’ criticism as well as a speedy recovery to Egypt’s Mohamed Salah after the latter’s UEFA Champions League and perhaps World Cup hopes were shattered in Saturday’s UCL final. Salah was substituted 31 minutes into the game after what appeared like a dislocated shoulder [Egypt national team doctors say it was a sprained joint] he suffered when Ramos pulled him to the ground. The Liverpool forward left the NSC Olimpiyskiy Stadium pitch in tears as he could no longer continue the game – albeit he had initially braved the pain. Real Madrid went on to win the tournament 3-1 courtesy of goals from Karim Benzema and a Gareth Bale brace. 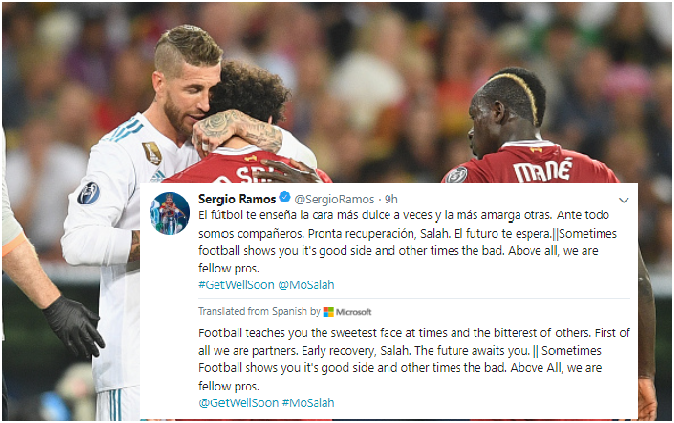 Several hours after the match; football’s number villain Ramos, tweeted an encouraging message part explaining football and part empathizing with the Egypt’s star man. Football teaches you the sweetest face at times and the bitterest of others. First of all we are partners. Early recovery, Salah. The future awaits you. || Sometimes Football shows you it’s good side and other times the bad. Above All, we are fellow pros. To search, type and press enter.